Engineering students judged the final round of the Maryland Regional. Fourteen students in the Science Technology & Society (STS) program of College Park Scholars (8 in the School of Engineering) provided a day of service to promote STEM education. 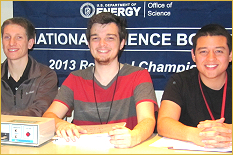 Most served as volunteer judges, helping to administer the middle school tournament of the National Science Bowl, which is sponsored by the U.S. Department of Energy. Prince George's Community College hosted the Maryland Regional event on Saturday, March 2, 2013. Many students from the College Park chapter of Tau Beta Pi also volunteered, resulting in University of Maryland students providing about half the volunteers needed. Judges of the final round included George Kaplan (STS and Materials Science Engineering), Will Collins (STS and Aerospace Engineering, and Mark Reese (Tau Beta Pi and Materials Science Engineering), pictured. Coordinating the volunteer effort were Gloria Shivers of PGCC and Aleem Boatright of LEGACY. Hundreds of students and parents came from all over the state of Maryland. Sixteen teams started the tournament, and Takoma Park M.S. won against Roland Hills M.S. in the final. College Park Scholars encourages service, and STS fulfills this expectation through a range of similar activities. STS students have volunteered as science demonstrators, judges, and as assistants at FIRST FRC events. Anyone may join us in these service activities. Email Betsy Mendelsohn, Director of STS Programs, for more information. See our photo albums of students engaged in service.